This year Dave, Brian, Patrick, Skipper and Jeff will be joining me for the 7th annual Yosemite Summit UNconference for men in ministry. 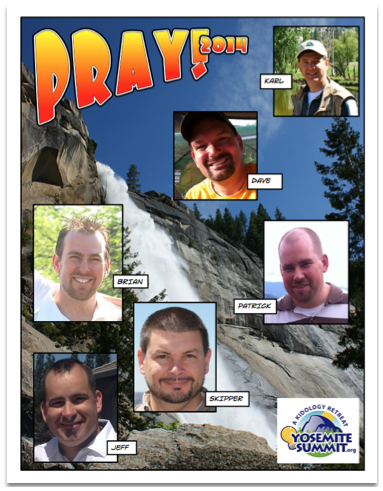 Whether you know us personally or not, we’d all appreciate if you would download this PDF Prayer Poster and post it somewhere you’ll see it and pray for us as we prepare to go, and while we are on this sabbatical retreat. That we would all get along and form Christ-like friendships. Whether God might want YOU to come to Yosemite Summit in 2015! If you have been considering Yosemite Summit, but it tends to fill up before you get a chance to register, MARK YOUR CALENDAR NOW for May 17-21, 2015. The sooner you block out those dates, the start to plan around them, the more likely it will be that you will be able to join me next year! I’m already praying for you.